Nunawading is a residential suburb 18 km east of central Melbourne between Box Hill and Ringwood. Nunawading was first the name of a parish bounded on the north by the Koonung Creek, on the east by the Dandenong Creek and Ringwood, on the south by Highbury Road and on the west by Boundary (Warrigal) Road, adjoining Camberwell. The parish contained the areas now known as Box Hill, Blackburn, Forest Hill, Mitcham, Vermont and part of Burwood/Burwood East. The Nunawading name was liberally used around the parish for various schools. In 1856 a school was opened in the Ballyshannassay village on Burwood Highway in the south-west of the parish and called Nunawading for nine years. Its later name was Burwood. In 1861 a school was opened on the border of Nunawading and Mulgrave parishes, to serve both areas. It was called Nunawading for 38 years before becoming Burwood East. Three other short-lived schools (1858-94), in the Box Hill area were named Nunawading. The name is thought to be derived from an Aboriginal word numphawading, meaning a ceremonial ground or battlefield. The Shire of Nunawading, created on 4 May 1872, comprised the parish. Its shire office was at Box Hill. On 26 May 1925, the shire was divided into two, the Blackburn and Mitcham shire in the east and the remainder renamed the Box Hill borough on 23 December 1925. Nunawading as a municipal name fell from view for 20 years until the Blackburn and Mitcham shire was proclaimed the City of Nunawading on 12 April 1945. Neither had Nunawading been a township name. The area now known as Nunawading was Tunstall, and remained so until 1945. Tunstall township was at the intersection of Springvale and Whitehorse Roads. The clearing of the land for firewood and agriculture had revealed deposits of clay. In the 1870s bricks and clay products were being produced, which had better access to markets when the Tunstall station was opened in 1886, four years after the railway line was extended from Camberwell to Lilydale. The name Tunstall derives from this activity, as Tunstall, England, was famed for its potteries. Clay products and orchards co-existed into the early twentieth century. 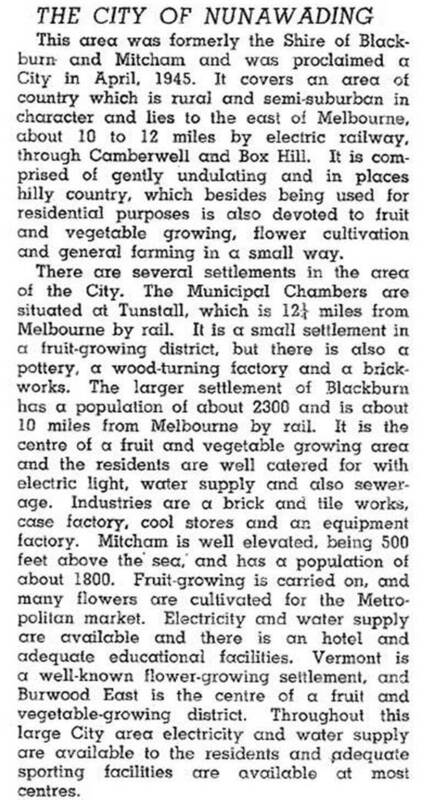 By 1920 the Victorian municipal directory described Tunstall as a residential and fruit-growing district with potteries and brickworks. At the outbreak of war the description had altered a little: there was a wood-turning works and Tunstall had the shire's municipal chambers. Tunstall’s census populations were: 688 in 1921 and 728 in 1933. In a residential sense, Blackburn and Mitcham were larger settlements, having 45% of the shire's population. The growth of postwar housing in Nunawading followed that in Box Hill and Blackburn. An early project was the Eastbridge migrant hostel in Rooks Road (1950-87), which was particularly isolated for its first ten years. The isolation was intensified by the separate primary school (1952-58). The change to an urban setting coincided with the opening of a new civic centre in Whitehorse Road, east of Springvale Road, in 1968. Twenty years later Nunawading's urban maturity was marked by the opening of the arts centre adjacent to the civic centre. A primary school had been opened in the Nunawading (Tunstall) township in 1923. Another at Nunawading South was opened in 1958 (replacing the school at the Migrant Centre), three years after a high school was opened. The Seventh Day Adventist church has a multi-use site in Nunawading, and the Nunawading Christian College adjoins it. Nunawading has a community shopping centre near the railway station, and Whitehorse Road is the location of metropolitan Melbourne's biggest bulky-goods retail strip – furniture, whitegoods, motor vehicles, hardware and electrical goods. In 2010 the railway line was lowered beneath Springvale Road and a completely new station was built. There are several neighbourhood reserves in Nunawading and a large reserve with sports ovals is near the civic centre in Whitehorse Road. Statistically Nunawading municipality was very nearly an average Melbourne suburb in the mid-1990s. Median house prices were a shade higher than those of metropolitan Melbourne in the 1980s; in the 1990s they are a shade under. The proportions of employees in industry occupations have more or less matched the pattern for metropolitan Melbourne, but with manufacturing declining slightly. Modes of journeying to work similarly mirrored the metropolitan pattern. *Box Hill excised **On 15 December 1994, Nunawading and Box Hill cities were re-united to form Whitehorse city. At the 2011 census, 10% of residents spoke Mandarin or Cantonese at home.